Wild orangutan numbers are also affected by the illegal pet trade, particularly for baby orangutans. 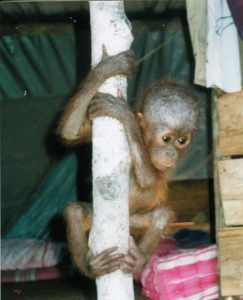 Many orangutans are smuggled into Java and overseas each year. 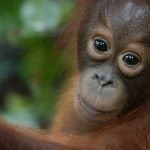 Indeed, a recent report by the Centre for Orangutan Protection and Nature Alert puts the number killed or captured for the illegal pet trade at as high as 20,000 over the past 10 years. While the orangutan is protected by both national laws and international conventions, authorities rarely prosecute and penalties are mild. For every baby that makes it to the backstreet markets of Bangkok or Taiwan, another two have perished. And to ‘harvest’ the babies a further five mothers are killed. The practice of keeping wild animals as pets is widespread in many parts of Indonesia, and wildlife markets are a feature of most large towns and cities. Although illegal, the keeping of primates as pets is common, and these primates, most often orangutans and gibbons, may be kept by families, in good conditions, in the same way people in western countries keep cats and dogs. In some circumstances, orangutans are also kept as status symbols, indicating an owner’s social status or wealth. Like all great apes, orangutans have slow life histories, and for the first few years of their lives, are docile, sweet and gentle. 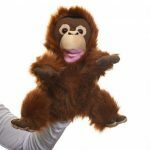 However, at around 5 years of age, an orangutan already has the strength of an adult male human, and by maturity, will be as strong as 5–7 adult male humans, with an unpredictable and possibly aggressive nature that makes them unsuitable as pets. At this stage many orangutans kept as pets are killed or kept in confinement. 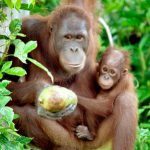 Easier access and encroachment of people into the orangutan forests also leads to increased hunting of orangutans for meat, babies and skulls, and more recently for orangutan penises. As well as being consumed as bush meat, body parts find their way into medicinal products or become tourist souvenirs. When adult females are killed, the babies can be sold as part of the illegal pet trade and the skulls of the dead may be used to create souvenirs that are sold illegally throughout Kalimantan. One of the more complex issues in orangutan conservation is the hunting of orangutans by local people for food, something conservationists have often shied away from dealing with, for fear of offending local sensitivities. The introduction of both Christianity and Islam to the region has seen a modification in the beliefs and practices of many of the indigenous people, and today, most Muslim communities generally refrain from eating orangutan meat. However, there is still a large local variation in this activity, and whether or not orangutans are hunted is strongly linked with tribal and village identity. 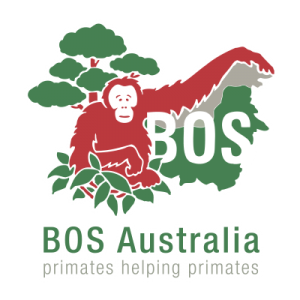 As part of BOSA’s commitment to saving the orangutan, we invest heavily in educating local communities, helping them to coexist peacefully alongside wild orangutans.